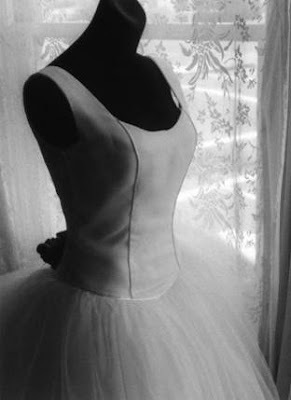 No, I don't expect you to sew your own gown after reading this awesome how-to book by Susan Khalje but promise some revealing insights about what goes into making your gown. 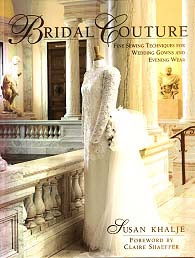 Bridal Couture has been a staple and research guide in my library since it was launched back in 1997. Yes, the cover gown seems a bit outdated today and so do a few of the other styles you'll find inside. The material in this book however is classic and Khalje uses beautiful photography to familiarize you with the many different laces and fabrics in her glossaries. You'll also get to see what a dress or gown looks like in all its muslin stages, built from the ground up. I highly recommend this book to any bride, especially one who is contemplating custom design. Check it out on Amazon and happy reading . . . Your gown is a very special and powerful piece of clothing. 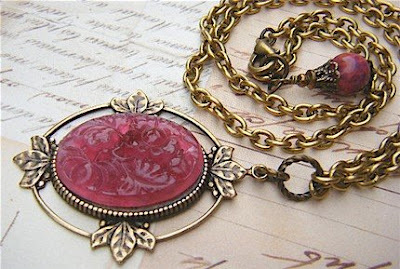 With it comes (or goes) a certain psychic energy that carries your joy and promise to the next wearer. 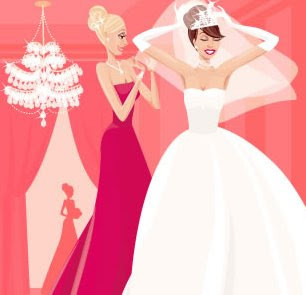 BRIDAL CONSIGNMENT- More of these places are cropping up for two reasons: Brides-to-be who won’t spend over 2000k on a designer gown, and former brides who don’t mind parting with their gown. As I’ve mentioned before, there’s little difference between second-time-around bridal consignment and the higher end salons. Owners are persnickety about what they take in and nothing goes on display unless it’s in top condition, cleaned and pressed like new. These shops have standards they follow too. They won’t take any Four Weddings and a Funeral style cast-offs, over altered or trashed gowns. DONATE TO YOUR FAVORITE CHARITY SHOP-Donating to a bridal consignment will earn you a share of your gown’s percentage. 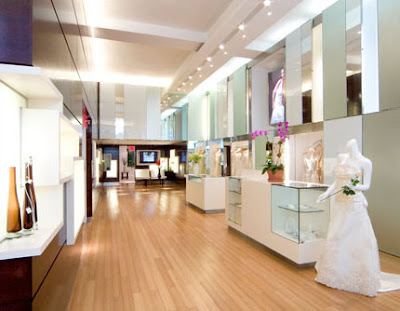 Donate to a shop like The Bridal Garden in New York City and fees will benefit NYC school children. Now wouldn't that make you feel great? 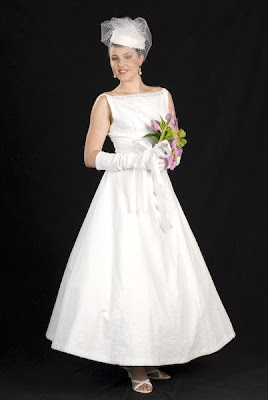 Few charities have a whole store exclusively devoted to bridal like the Bridal Garden though. Most will have a section for gowns and formal wear. Don’t forget your bridesmaids. There are foundations like the Princess Project that have a selection of prom and bridesmaid dresses that help young women get out to that big night in style. Ever wondered what happens to all those bridesmaid dresses once the wedding is over? I was in my neighborhood charity shop yesterday when I spotted one: the proverbial shiny triple tiered pink that looked as if all the air had been let out of the ruffles. 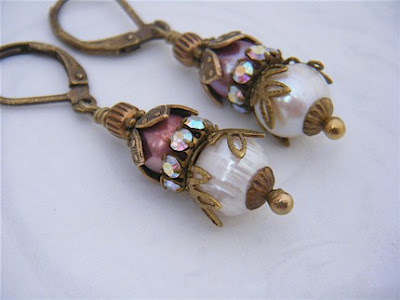 This, like countless other once-worn pastels hang in many a thrift shop or stuffed away in the back of a closet. More resourceful bridesmaids have been known to make pillows and patchwork throws out of them. WEEKDAY WEDDINGS: A New Look at the Civil Ceremony. The brief city hall ceremony is every bit as significant as the wedding planned months ahead. No longer considered the spontaneous events they once were, civil ceremonies are going through new approval and popularity. 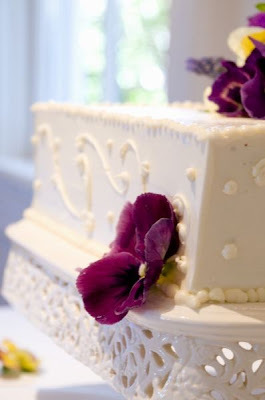 Some couples prefer the ease of this short celebration and how they share in it with friends and family. Read more . . . .
There’s no rule anymore about pairing short veils exclusively with street length dresses. Whatever guidelines exist these days have more to do with following your proportions and sense of style. 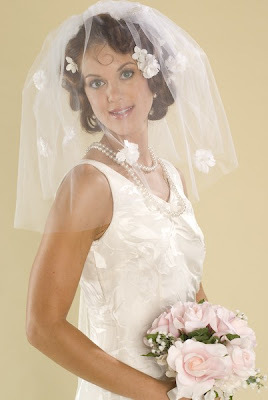 The shorter ‘fashionista' veil is gaining in popularity. Why? 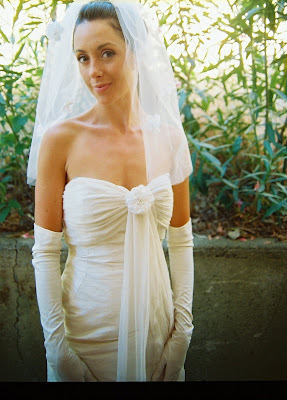 Short veils are out of the ordinary –very outside the traditional bridal box right now. There's something chic, even edgy about a bride sporting one. As early as the 1990s, Vera Wang reinvented pairing short, pouf veils with very formal gowns. Whether she wanted to show off the extraordinary back details of her gowns or usher in a new look, I don’t know; I only know the juxtaposition this duo created worked. Bird Cage or Net Pouf-Made of either netting or tulle, this veil falls above the shoulder line. Since it’s a shorter style, it tends to look structured, more hybrid of headpiece and veil. Great for fashionistas. 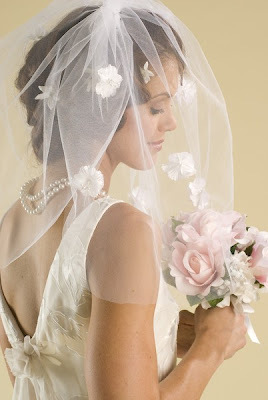 Blusher or Flyaway-Typically the length veil worn over the face during the ceremony. Can also be worn shoulder length in layers. Although considered informal, this is the choice of some chic, formal-gowned brides. 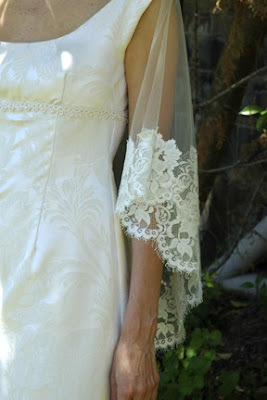 The Petal Veil-Pictured right is above the shoulders and the front curves something like flower petals opening. Scarf-Great option for the bride going informal. Some scarves though would pop and rock with the right formal gown as well. 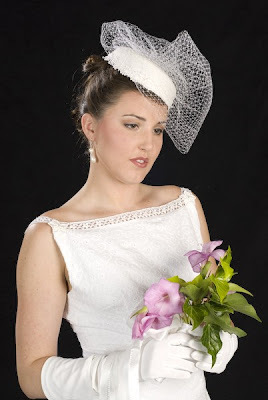 Nose Veil-Typically worn over the face and attached to a headpiece or hat like the one pictured below. The above photo is a great shot of pros on a recent photo shoot: Hair stylist Kathie Rothkop and make up artist Rob Ward get Sarah ready for Trevor Henley and his camera to take that great Mae West/Marie Antoinette image below. I'd like to take this time to thank the people who have helped me in in the past months. Only with their help have I been able to present Bride Chic as a back drop for my own collection and forum for other artists and stylists. It is a unique vision I have had for years. No vision is ever solely the work of one artist but many whose talents converge all at once. Kudos go out to this extraordinary group of photographers, models, hair stylists, make-up artists, web people and fellow bloggers who have brought their own kind of excellence to contemporary bridal fashion. Again, thanks to all who have contributed to Bride Chic! REMEMBERING WHEN . . . .
Remembering what it is like to get married . . . here I am with my beloved hubby, Edgar on our wedding day years and years ago. He wore a kilt, I wore a wreath and gown I designed out of 10 yards of imported French lace. The photo is by Hope Stewart, her work very loved and respected here in the San Francisco Bay Area. All her work carries a romantic feel to it--and that was my initial attraction to her. She's retired now but left behind an awesome body of work. I’ve spent most of my life in blue jeans so I have no idea what to look for in a wedding dress. I like the idea of wearing a long, white dress on my wedding day but I’m finding it confusing to know what I’m going to look good in. I’m 5’9” and slender. Can you help? How lucky can you get? You’re going to hear it again and again—tall women look best in any style (well, just about) whether it be ball gown, A-line or sheath. Some words of caution though: There have been some tall, svelte, otherwise lovely brides of late who went way over Niagara with the frou-frou and piled on drapery. Yes, you certainly can carry around more weight and bulk than most but still need to keep scale and proportion in mind even if you are tall. *Sheaths and evening gown silhouettes. They really compliment your body if you’re in shape. *Two-piece dressing like a floor-length suit or coat and dress combo. It’s original and takes someone like you to really carry it off. *Shrugs and boleros. You’re one of the lucky few that can wear them. * A ball gown. Talk about drama! You’ll look like Giselle! 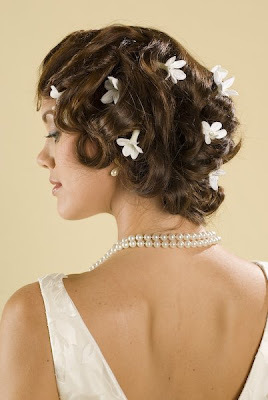 *You can go all out and carry off all those beautiful back details: florals, bows, big and intricate bustles, etc. 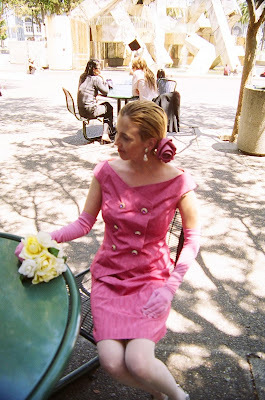 *Heavier fabrics like brocade and velvet, you can carry them..
*a wide belt or sash in a contrasting shade or color if you want to appear shorter. 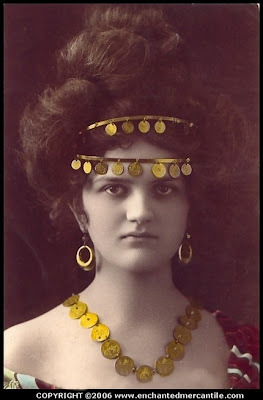 *Bouffant hair-dos and high headpieces. Unless, that is, your groom has the proportions of Wilt Chamberlin. *Victorian gowns with high necks and long tight sleeves. All that elongation puts you over the top. *Long panel trains. You’ll come off even thinner. 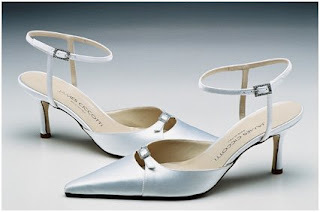 *Flats or ballerina slippers if your hem is above the floor and your feet are long and narrow. You’ll come off looking like Olive Oil. EVA. The most versatile gown in my collection, I think. 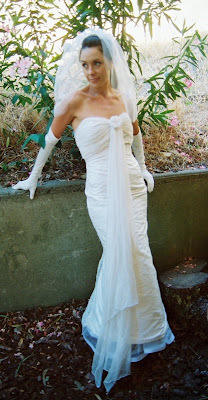 We amped up the glamour factor for Sarah here by adding the birdcage veil and opera gloves. Labels: bridal couture, bridal designers, bridal gown, bridal gowns, bridal wear, cotton wedding dresses, custom bridal, wedding designers, wedding dress. Gorgeous! 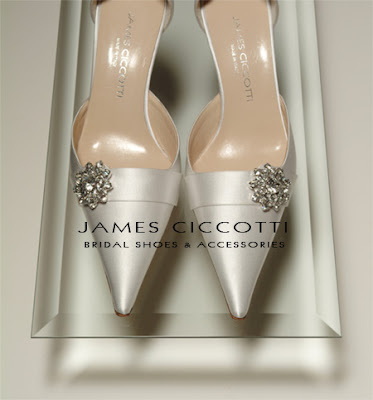 It's as if Chicago shoe designer James Ciccotti crafted these shoes to go with just about every gown I ever designed. With the shoes above I am especially in love. Feathers. Cocktail hats with veils. 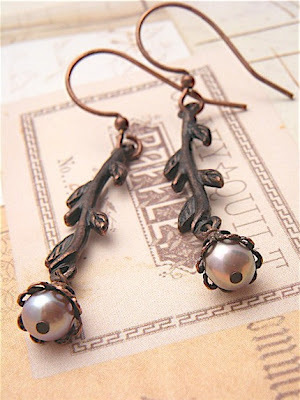 Long strands of pearls. Opera gloves. This simple cut velvet gown with just the right accessories instantly becomes retro. The veil of this hat easily becomes a shoulder drape. Once this whole look is pulled together it can be reminiscent of pre-1920s as well as 1930s Hollywood. Admit it, this cotton eyelet dress is about as hourglassy as you can get. Whether you go flared or straight up and down, the silhouette you choose is going to be the foundation of your look—the first impression you create once you make your entrance, dance your first dance, cut the cake. The right silhouette creates a positive visual chemistry. Something like a light turned on, illuminating the unique beauty of your female form. 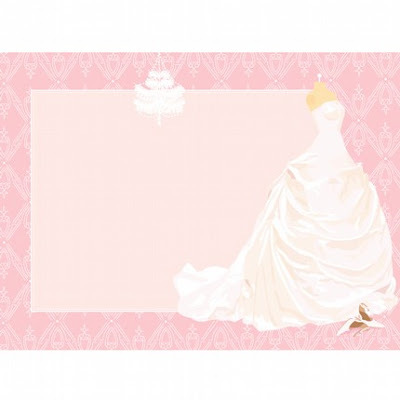 There are three basic silhouettes: the sheath, the ball gown and A-line. Within each of these big three derive a few variations deserving closer examination. 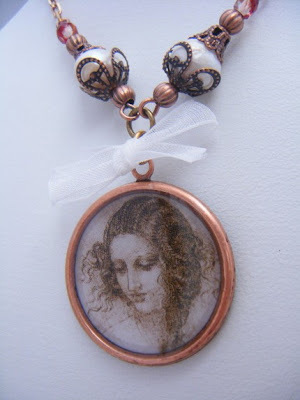 Read this article . .
For sometime now I’ve wanted to add hair art as an ongoing feature. Watching the love and care stylists put into their work makes me realize just how much hair is indeed an art form. 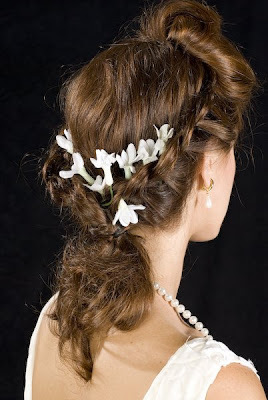 With or without the veil, hair is one of the most significant aspects in pulling together a total look. Shown here is the extraordinary work of hair designer Kathie Rothkop of Salon Glam in Novato California. Working with her on this shoot was awe-inspiring; she wove wonders with flowers and hair jewels, wigs and the layering of locks. 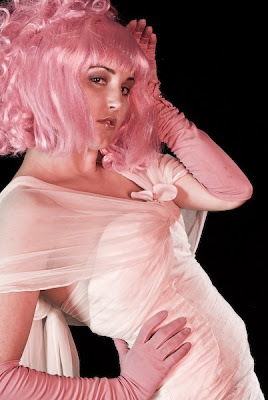 Her appreciation of hair history is especially seen below in Kellie’s 1930s film goddess look. Top: 1930s glam look. 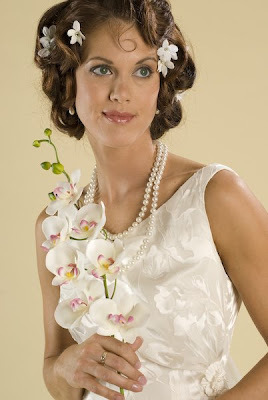 Rhinestone studed Stephanotis blossoms decorate Kellie’s marceled and wrapped sweep. 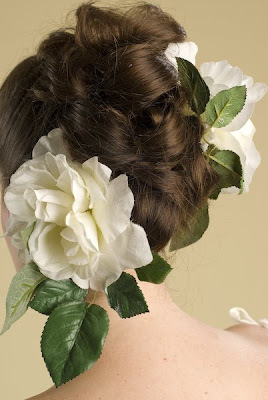 Middle: Florals add romance to Sarah's bun. 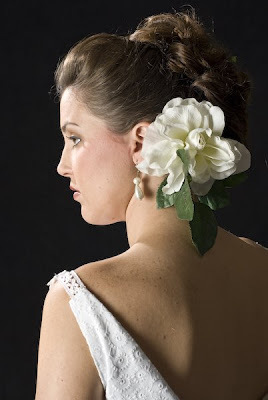 Below and Bottom: Braids wrap and fall loosely as stephanotis is placed along this hair roll. I love this girly kind of look you find on chick lit covers. Cheryl Hoffman of Cheryl Hoffman Illustrated Stationary has an Etsy Store full of these adorable images. 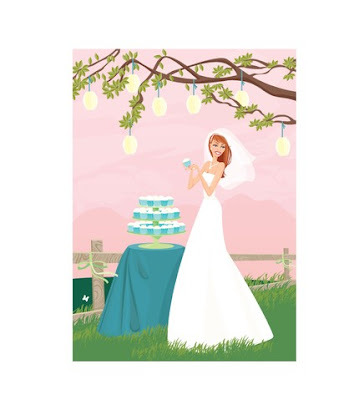 The greeting card middle left Cheryl created during her engagement. 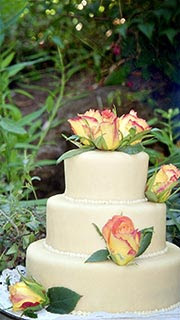 She says, "I was daydreaming of different styles of weddings and pouring through all the beautiful bride magazines. Deciding which kind of wedding to have is so difficult. I really needed about 10 weddings to fullfill my creative dreams. For this piece, my thoughts were of something airy and lazy. I could almost hear the breeze in the leaves and feel it brush away strands of hair on my shoulder. Silent and dreamy, like something in a super8 film but elegant and fresh as well . . . ."
For everyone reading my post on sample sales last week, you remember I promised a list of up and coming events in New York. Here it is. The Wedding Atelier is offering three select closets of designer samples by Melissa Sweet, Priscilla of Boston, Nicole Miller and others. The closets are samples of marked down gowns--no sale deadline. Suppose you’re in love with one particular designer’s collection? Unfortunately, due to space and overhead issues, your salon can only stock one or two samples—not the entire collection. Still, you want to actually get a real live look at those 20 other gowns you saw online. In that case keep a lookout for your favorite designer’s trunk show. A trunk show is when a designer like Reem Acra makes a personal appearance at a nearby salon or department store, say Friday and Saturday only. What’s great about this is she or her representative will be there along with the entire (yes entire) collection. So all those gowns the salon doesn’t carry in sample form you can finally get a look at. In addition, you can actually meet and pick your favorite designer’s brain—ask about any changes in fabric, lace, color, etc. The result: your best opportunity to get your dress customized. Keep in mind, just like Cinderella’s Ball, trunk shows have a time line. You pretty much have to know what you want and make your choice before the weekend is over. Therefore trunk shows are not ideal for the browsing phase of your search. Hopefully you’ve shopped prior and at length so you know for sure that this is it, this is The Gown. If you think you’ll be placing an order at the trunk show, be ready. 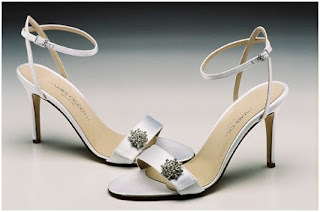 Bring along the shoes and kind of underwear you’ll be wearing your wedding day in order to have measurements taken correctly. And do make an appointment. Just imagine if Vera Wang showed up this Saturday at Saks. Enough said. FYI: Miss that trunk show last week? Or maybe no salon in your area carries the designer you want. If you absolutely love a particular designer consider traveling to her flagship store. There you can see her complete collection. 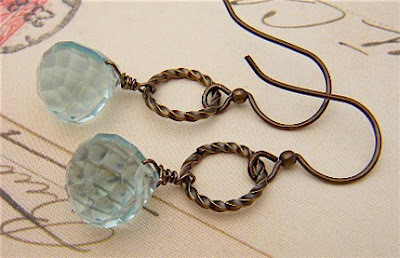 Also, if you want something custom designed, think about becoming one of her private clients. True, you’d have to invest much more time and money, traveling to New York or LA. But if you happen to in be the metro area of your favorite star, do check into this. Although you won’t hear it publicized much, most top designers have a flagship store as well as custom clientele they cater to. I've had the EVA gown in the collection a few months now. To date its been photographed about six different ways (Eva's versatile). I took these photos at Sarah's fitting about two weeks back. She looks so fabulous in this gown I just had to share. We had the actual professional shots done today with Berkley photographer, Bill Smoot. We shot this gown and several others. What a beautiful way to spend the day! Fair skies, seventy degrees in the Berkley Hills working with a top flight hair stylist, model and photographer . . .